Many years ago when trawling through Antique or Junk shops it was not uncommon to come across a NUPPO badge, usually accompanying Police Badges or Medals. Not so these days as the badges seldom come to light but do appear from time to time on e-bay. I think that Metropolitan Police, Birmingham City, Birkenhead or Liverpool Police Medal/s to a Striker would be enhanced with the display of a Badge that signifies the sacrifice that came with Loyalty to the National Union Of Police and Prison Officers. Very nice Peter, have not seen this before, any chance of an image of the reverse please. Spot on Peter. Had forgotten that they even had a badge. Thanks for sharing mate! Thanks for sharing this with us Peter, it is a first for me as well, Simon. Thanks Fellas, Simon, It is at present in a frame but it has a horse shoe fitting and is a lapel badge. I will have a look to see if it is named and " Attempt" to scan and post an image. 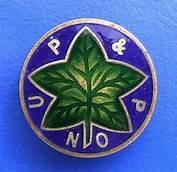 I do know of several relatives of strikers who wear a NUPPO badge in honour of their forebear. Hope this helps as I don't think badge will scan too well. This badge was in a Princess Mary WWI box with a 1914-15 Trio (Coldstream Guards) and Lverpool City Police medals, to Wilfred Clarke HARE, who was from the North East but joined Liverpool City Police 1912, joined Army at outbreak of war (Maybe recalled to Colours) rejoined Police as Constable 105"B" after being wounded and discharged (correct Wound Badge with Group) He was not a Striker as he retired on 25/1/1937 after 25 years service but may have been a NUPPO member. Who knows he may have been one of the 50 "Lost Sheep" who returned to the fold before the deadline set by the Watch Committee thus escaping the fate of approx. 955 colleagues who were cast into the wilderness of unemployment. Wilfred passed away on 17/12/1966 aged 75 years. Thank you very much for that, as you may guess I am always interested in medals to the Coldstream Guards so an extra bonus for me.